A clean-burning kerosene lamp invented by Michael Dietz in 1857 saved the whales from extinction. Prior to the 1800s, torches, candles made from tallow, and lamps which burned oils rendered from animal fat were in popular use. In the late 1700s sperm whale oil was popular for lamp oils and candles because it burned with less odor and smoke than most fuels. However, sperm oil was very expensive. A gallon in the early 1800s cost about $2.00, which in modern values equates slightly over $200 a gallon. 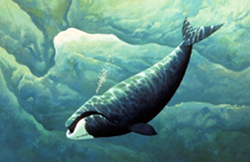 The demand for whale oil took a tremendous toll on whales, and some species were driven to the very brink of extinction. In the Early 1800s whales were killed at a rate of about 15,000 per year. Sources estimated that there were 50,000 of various species of whales remaining in 1850. Invention of the kerosene lamp had an immediate impact on the whale industry. Kerosene was easy to produce, cheap, smelled better than animal-based fuels when burned, and did not spoil on the shelf as whale oil did. Most people could afford kerosene; it sold for less than 7 cents a gallon. The public abandoned whale oil lamps almost overnight. If it had not been for the invention of kerosene lamp and abundance of cheap kerosene the whales would soon have become extinct.